In theory 2010 is Bridgestone’s last year in the sport, although there’s been very little in the way of public discussion about potential replacements. There are certainly ongoing efforts behind the scenes to persuade the Tokyo management to change its mind, although it’s not yet clear how likely that will be. The irony is that in PR terms tyres will very much be in the spotlight this year, perhaps to a greater extent than any season since 2005, when both Bridgestone and Michelin had to make a single set of tyres last a whole race distance. This year there’s a different set of challenges. The first is that the fronts are 20mm narrower, for the simple reason that when the change was made from grooves to slicks, Bridgestone wanted to keep a check on the amount of rubber in contact with the track. However they couldn’t downsize the fronts last year because the teams had already begun designing their cars around the standard size front. That’s no longer an issue this year, as designers have had plenty of lead time, so the fronts have duly shrunk. 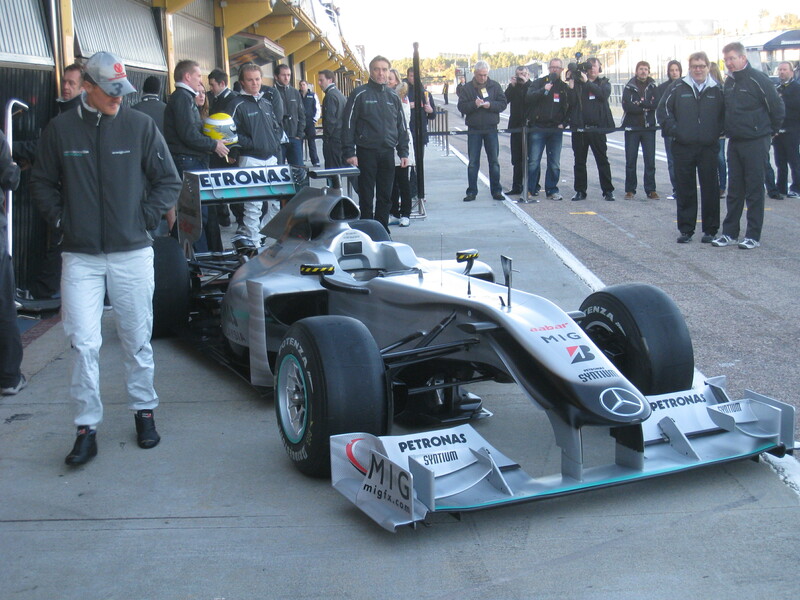 The other big novelty for 2010 of course is the ban on refuelling. That has two effects. Firstly the huge extra weight that the cars carry at the start puts extra stress on tyres, and secondly fuel no longer plays any role in determining strategy. It’s now all about managing tyres and making the best use of the rule that forces everyone to use option and prime at some stage during the race. In addition, only last week we got confirmation that those who make it through to Q3 now have to start the race on the set of tyres on which they qualified. That’s going to have a massive impact. Tyres are the new fuel load, you might say. Last year it was all about how much fuel the Q3 runners would put into the tank as they balanced out the requirement to qualify at the front against the need for a good race strategy. Those outside the top 10 could look at the shape of the grid, and then make a call on fuel loads. Now, exactly the same will happen with tyres. And as with fuel loads we’ll probably see those who just scrape into Q3 making conservative choices, qualifying on the harder tyre and accepting ninth or 10th place in the basis that it will be a better choice for the start. The teams had their first experience of the 2010 soft and supersoft tyres at Valencia last week, but the real test will come at Jerez, where they will try the softs, mediums and hards at a track which is much more punishing on the rears. Bridgestone has done its homework but then, but he also said that 2010 downforce levels are already higher than anticpated, hinting that the tyres may be more marginal than had been thought. In addition, only last week we got conformation that those who make it through to Q3 now have to start the race on the set of tyres on which they qualified. That’s going to have a massive impact. Tyres are the new fuel load, you might say. Last year it was all about how much fuel the Q3 runners would put into the tank as they balanced out the requirement to qualify at the front against the need for a good race strategy. Those outside the top 10 could look at the shape of the grid, and then make a call on fuel loads. I think we should be a bit more frank about what this really is. Just like with the fuel loads this year, this is about artificially handicapping the top ten qualifiers. Say the new Lotus is good for row nine on the grid at best and Jarno Trulli pulls off one of his uber-qualifying efforts to stick it in the top ten. Why should he be punished? Come to think of it, why should anyone in the top ten have to be compromised in this way? Those who qualify 11th and lower shouldn’t be getting help from the rule makers – it’s their job to build better cars and drive them more quickly. That’s the point of F1. F1 needs to get rid of arbitrary, ‘performance-adjusting’ rules like this. It’s a slippery slope that leads to success ballasting and other nonsense that don’t belong in proper motor sport. I totally agree with Keith Coltantine! There’s way to much bu–s-it going on in motorsport nowadays, the so-called rulemakers spend too much time trying to find ways to juggle the results of races. Who are they juggleing results for, and for what purpose? Talk about confusing the fans! Just let the teams and drivers get on with it and the results will come! Seems funny that we’re not alowed “team orders” to manipulate results, but FIA can do it themselves!